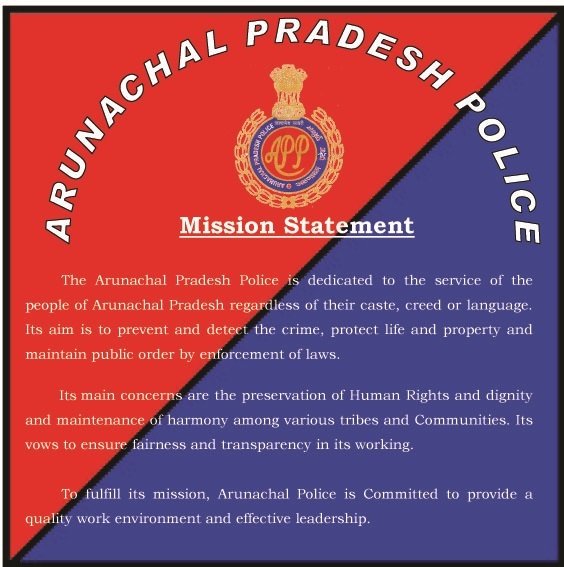 This website http://arunpol.nic.in is an information service offered by Arunachal Pradesh Police. Though all efforts have been made to ensure the accuracy and currency of the content on this Website, the same should not be construed as a statement of law or used for any legal purposes. Arunachal Pradesh Police / NIC accepts no responsibility in relation to the accuracy, completeness, usefulness or otherwise, of the contents. Users are advised to verify/check any information with the relevant Government department(s) and/or other source(s), and to obtain any appropriate professional advice before acting on the information provided in the Website. In no event will the Government or Arunachal Pradesh Police or NIC be liable for any expense, loss or damage including, without limitation, indirect or consequential loss or damage, or any expense, loss or damage whatsoever arising from use, or loss of use, of data, arising out of or in connection with the use of this Website. Links to other websites that have been included on this Website are provided for public convenience only. Arunachal Pradesh Police / NIC is not responsible for the contents or reliability of linked websites and does not necessarily endorse the view expressed within them. We cannot guarantee the availability of such linked pages at all times. At many places in this Portal, you shall find links to other websites/portals. This links have been placed for your convenience. Arunachal Pradesh Police / NIC is not responsible for the contents and reliability of the linked websites and does not necessarily endorse the views expressed in them. Mere presence of the link or its listing on this Portal should not be assumed as endorsement of any kind. We can not guarantee that these links will work all the time and we have no control over availability of linked pages.